Alice is becoming a pro at birthday parties. At first, she doesn't want to go because its not HER birthday, but once she realizes that she is going to get to have fun too....she is ready to roll. 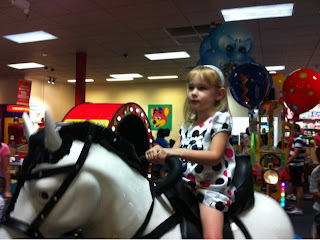 The last party we attended was for Bergie at Chuck E Cheese. 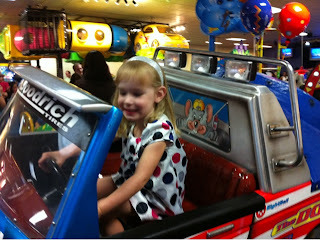 We spent 3 hours there and Alice earned 150 tickets which she spent all on small plastic hearts and stars. She also played air hockey for the first time. 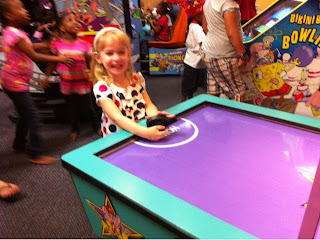 They have a pint sized table perfect for her age and she had fun even when she hit the puck into her own goal a few times.